After winning the Big Ten championship Saturday night, there were plenty of questions and very little answers surrounding the Ohio State Buckeyes possibly being one of four teams to make the Playoff this season. Although the biggest question was answered Sunday afternoon, with the Buckeyes finishing No. 6 in the final Playoff rankings of the season, there seem to be plenty more questions as well. For the third year in a row, the Big Ten champion didn’t make the Playoff. Let that sink in. Ohio State not only finished outside of the Final Four after winning the Big Ten championship for the second straight year, but they also finished behind Georgia. The Bulldogs finished with two losses and got beat by Alabama in the SEC title game. My question: What did Oklahoma do yesterday that they deserved to jump Georgia that the Buckeyes didn’t? While putting the Sooners in and leaving the Buckeyes out somewhat makes sense, keeping Ohio State behind Georgia in the rankings is laughable. 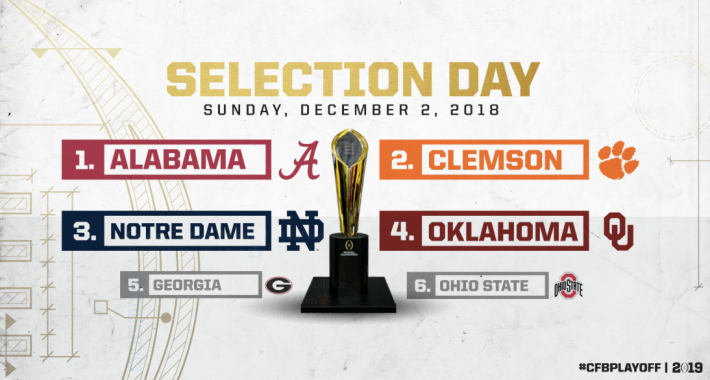 The College Football Playoff committee lists five protocol that it uses to decide between teams that are considered comparable, which they admitted that Ohio State, Oklahoma, and Georgia are: Conference championships, strength of schedule, head-to-head competition, outcomes of common opponents and other relevant factors. Conference championships are important? Notre Dame (not in a conference) and Georgia (didn’t win the SEC) finished ahead of Ohio State. Strength of schedule is valuable? The Buckeyes had much better wins than the Bulldogs, Irish, and Oklahoma. Otcomes of common opponents? Ohio State dominated Northwestern and Michigan, unlike Notre Dame. I’ll let you figure out the rest. This metric has been used to select 15 of the previous 16 playoff teams (Buckeyes were No. 6 in 2014). For back-to-back years, a one-loss Buckeyes team that won the Big Ten championship was hurt by their lone loss of the season. Both losses were blowouts, and the committee didn’t forget about it. In 2017, it was the scarlet and gray getting embarrassed in Iowa, 55-24; in 2018, it was their 49-20 loss at Purdue. With all this said, a trip to Pasadena, California to play in “The Grandaddy of Them All” isn’t a bad consolation prize. As the Big Ten champ and finishing outside of the Playoff, the Buckeyes will take on the Washington Huskies, who won the Pac-12 title. The game will take on January 1, 2019.